Happy Easter! How are you all enjoying the long weekend? Here in Australia, most of us get a four-day weekend, and I'd really been looking forward to it! It's been relaxed so far - I went out for dinner and a friend's birthday drinks last night, and seeing as most shops are closed on Good Friday, we've been having a mega-chill day - staying home, drinking tea, and watching a marathon of Rick Stein's Long Weekends. So relaxing! 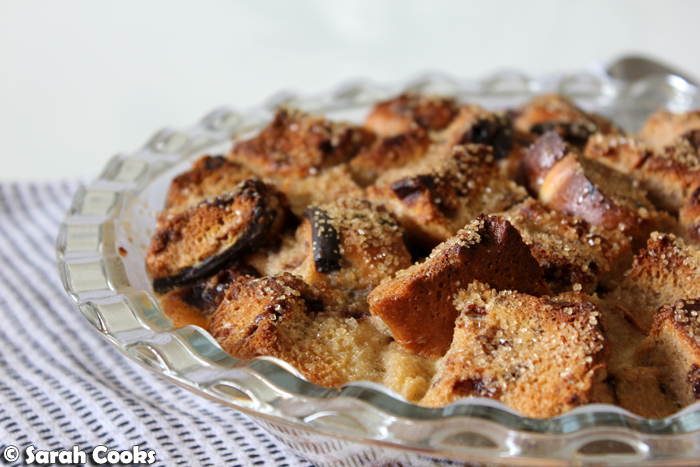 I also took advantage of the extra free time today by baking a delicious, decadent hot cross bun pudding! 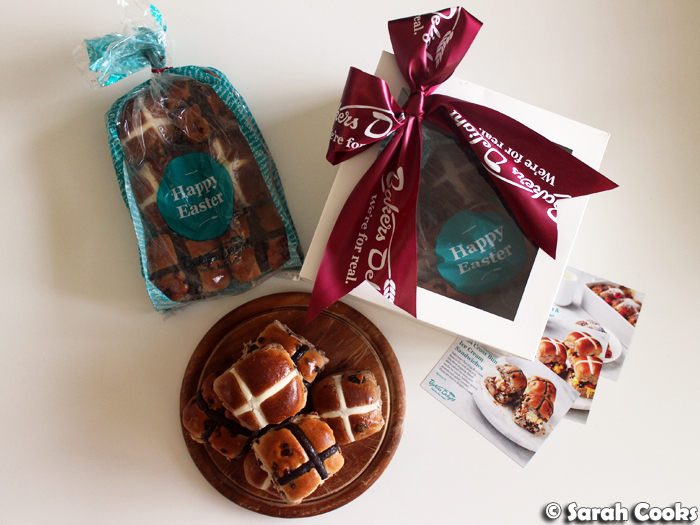 You see, last week I went to a really fun Baker's Delight Easter Baking Masterclass, and they sent us home loaded with heaps of our freshly baked hot cross buns. I ate them, I shared them with friends, I gave some away, but I still had heaps left over! 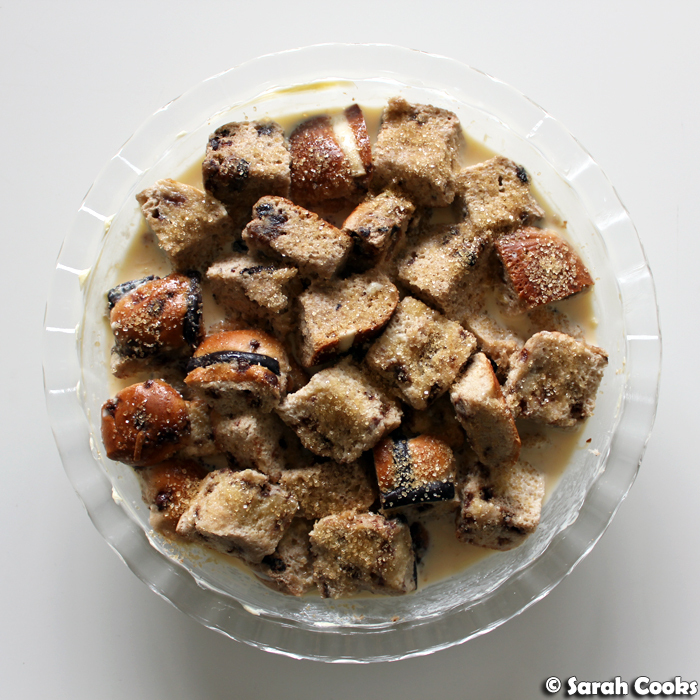 Hot cross bun pudding to the rescue! Before we get to the pudding, let me show you a couple of pictures from the class! 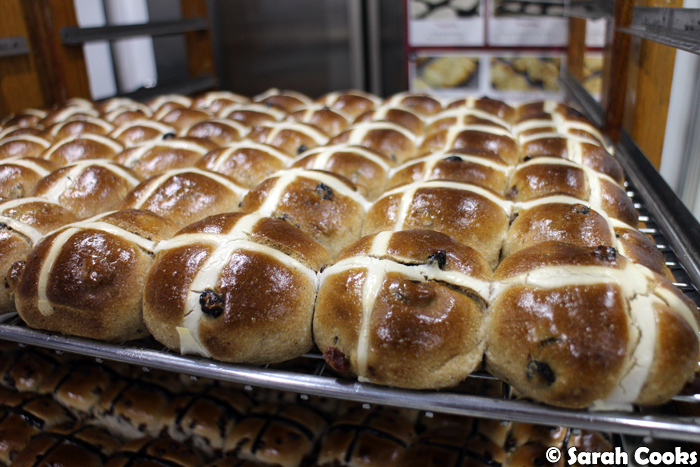 I love all hot cross buns, but let me tell you that a freshly baked hot cross bun, right out of the oven, all steaming and fluffy, is a joy to behld. Here's my stash of buns. (Heh). 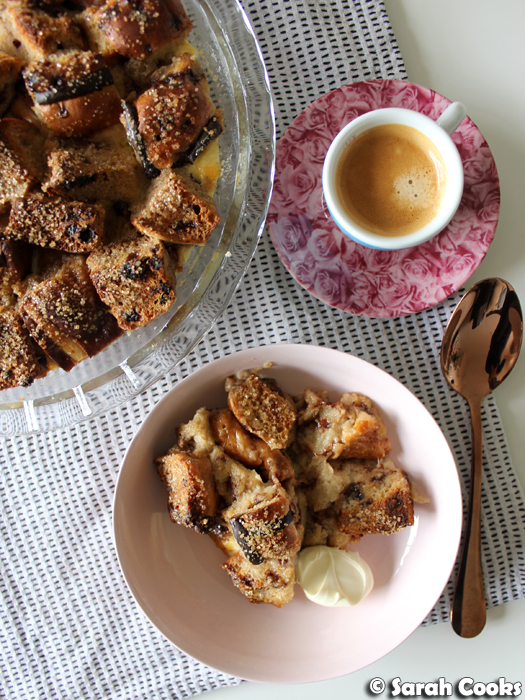 I know that a hot cross bun bread and butter pudding isn't a particularly original idea, but it is a particularly good one. The spices and dried fruit in the buns are just so perfect in the soft-set vanilla custard. 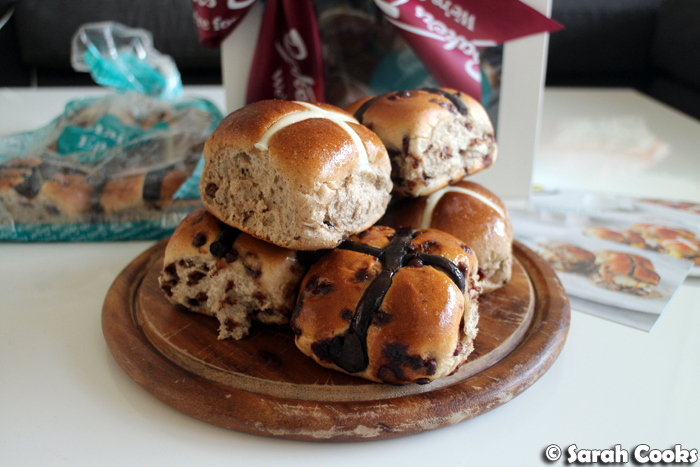 I used half choc-chip and half regular hot cross buns, but just use what you prefer. 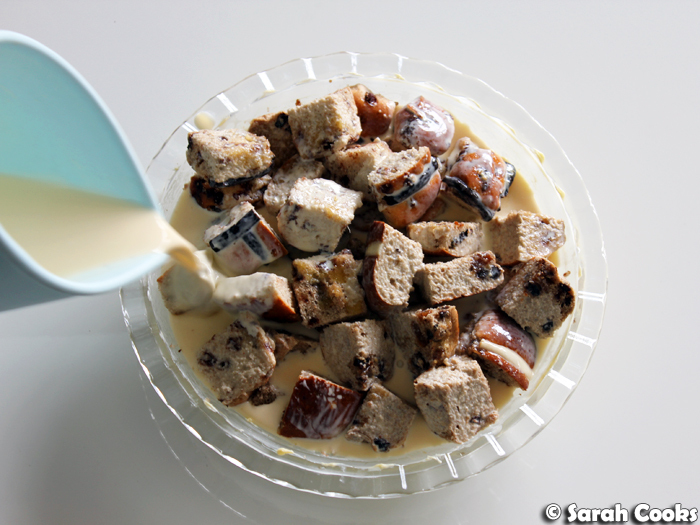 The custard was a simple mix of equal parts cream and milk, plus eggs, a little sugar, and vanilla. 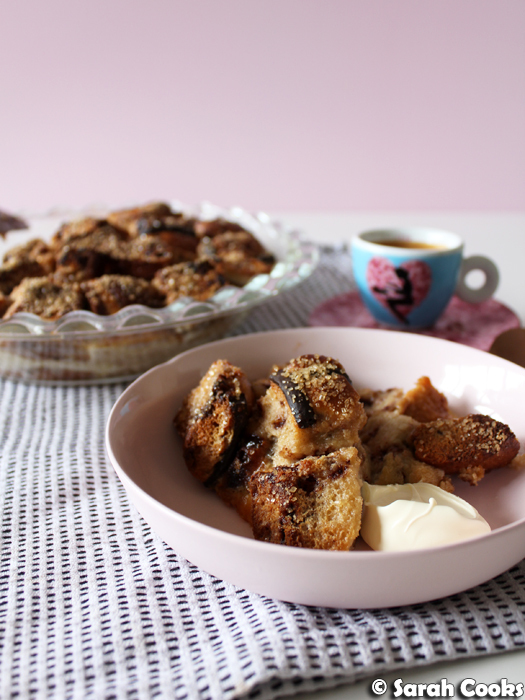 (If I had been using regular bread or brioche, rather than hot cross buns, I would have added some cinnamon too). Either way, forty minutes in a warm oven and you have a wonderful pudding! The kitchen smelled so amazing as it was baking. Check out that crunchy top! I think the crunchy top might be the best bit. Later in the afternoon, I took some of the pudding over to my parents' place, and the first thing my mum did was to pick out a crunchy, sugar-crusted piece from the top and pop it straight in her mouth! Delicious. This pudding was a bit of an experiment for me, and I'm so pleased that it turned out so well! In contrast to the buttery and crunchy top, the inside was wonderfully soft and creamy. 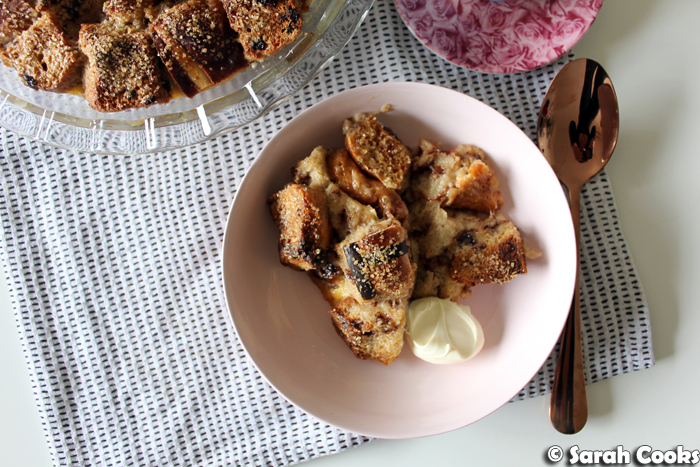 With the spicy flavours of the hot cross buns, and the eggy-vanilla custard, it was a fabulous combination. I served generous portions of the hot pudding with cold double cream. Heaven! 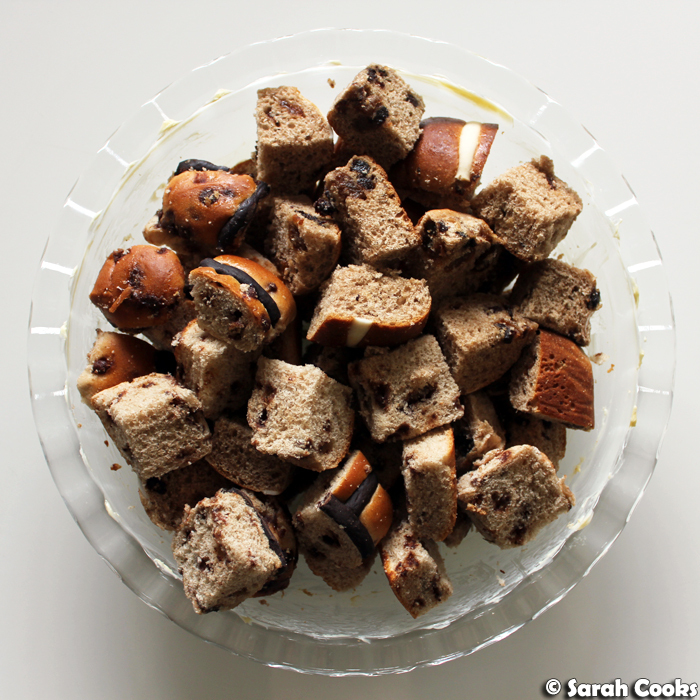 Cut the hot cross buns into 8 chunks each and set aside. I cut them in half horizontally across the middle, and then into quarters, to make rough squares. (If you're freezing the hot cross bun pieces, place them in a ziplock bag or airtight container and freeze. Remove from the freezer and defrost before proceeding with the rest of the recipe). Whisk together the eggs, cream, milk, vanilla and caster sugar. Melt the butter, and grease a 27cm pie dish. (You won't need all the butter). 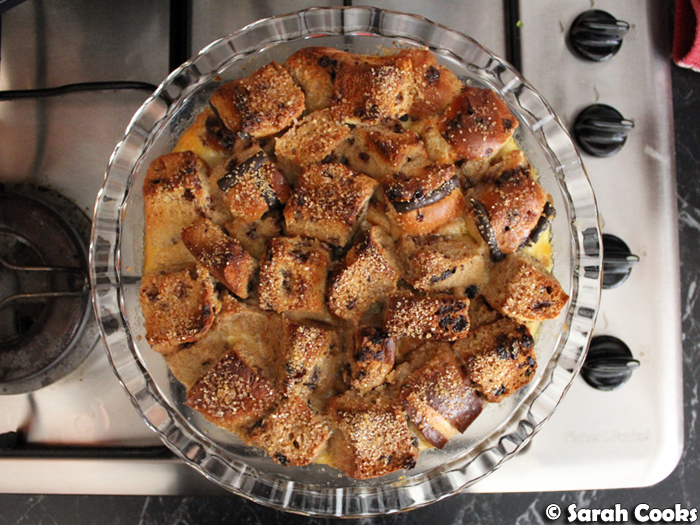 Pile the hot cross bun cubes into the buttered pie dish, and pour the remaining melted butter over the top. 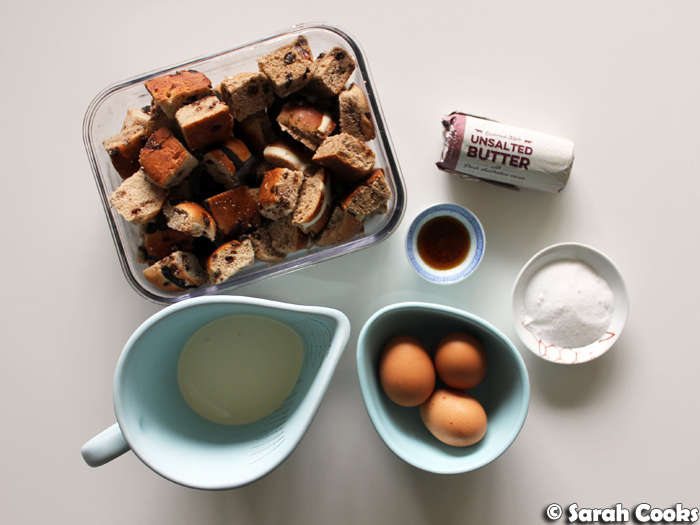 Pour the eggy-cream mixture over the bread cubes and allow to sit for 30 minutes to an hour. Meanwhile, preheat the oven to 170C. Sprinkled the pudding with the demerara sugar. Place the pie dish in a large roasting tin, and pour hot water from a recently boiled kettle into the tin to come halfway up the sides of the pie dish. Place in the oven and bake for 40 minutes, or until golden brown on top and puffed up. Remove from the oven (and remove the pie dish from the baking tray). Allow to cool slightly before eating. The sugary crusty bits are definitely the best bit. I like how you've maximised this with the shallow pudding. I don't blame your mum either - I would have done exactly the same thing!